The DY 42X-5RZ concrete boom pump is a lightweight and maneuverable unit with the power to handle high-volume applications. Manufactured by a brand known for product quality and innovation, this 42-meter concrete boom pump features an advanced design that helps you get more done in less time and with greater efficiency. These mid-size boom pumps are capable in a variety of commercial and large residential construction projects that require the accurate placement of concrete to hard-to-reach places. Whether you are laying a foundation for a commercial office complex or putting in a swimming pool or slab for new construction, Dynamic Concrete Pumping, Inc. is ready to assist. 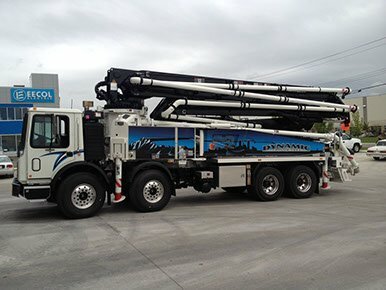 We offer comprehensive pumping, pouring, placing and finishing solutions using industry leading equipment and techniques. Give us a call or submit our online information form to request assistance from a member of our professional team.